YES! We are finally in Alaska (not counting Hyder)! Shortly after we left Milwaukee on the first day, Jeff jokingly asked, "Are we there yet?" Well, now we are. We did first have to conquer the Top of the World Highway in Yukon before crossing the border but it actually was no problem at all. It helped that we got a beautiful day where it had rained enough during the night to keep the dust from the gravel down but not too much where it was muddy. The first 60 miles are in Canada and then you cross into the US at a border crossing so remote that the agents actually live in a cabin right at the border. The road was brand new asphalt with freshly painted center lines as soon as we got into the US prompting us both to feel kind of proud of our country but we were slapped with reality a few miles down the road. The rest of the Top of the World Highway in the US was the worst road we had driven on to date. 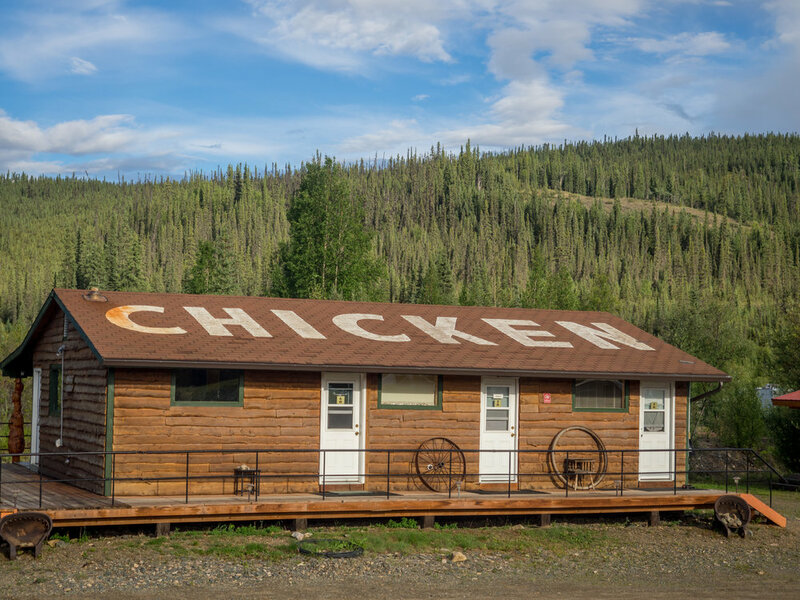 The highway ends and becomes the Taylor Highway which took us into our first Alaskan town experience - Chicken. 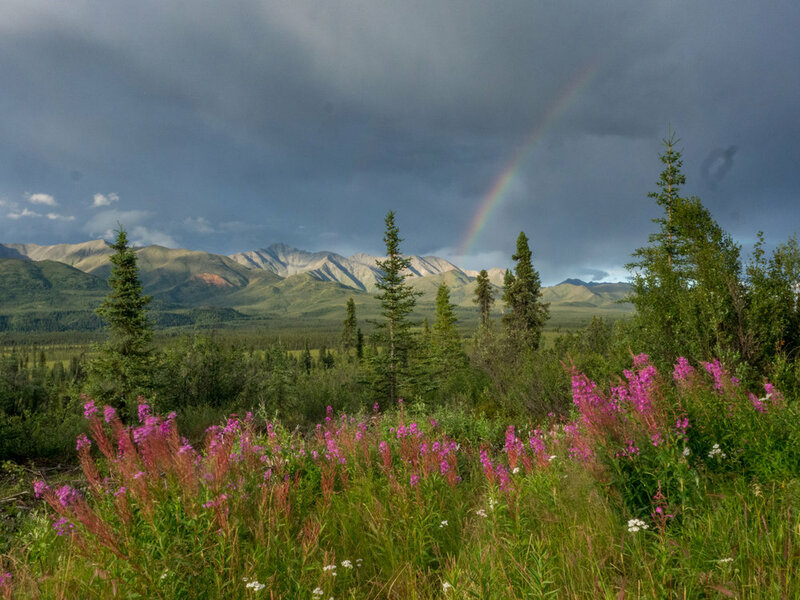 There is actually history here and, like most of the Yukon and this part of Alaska, it is linked to the gold rush of the late 1800's. 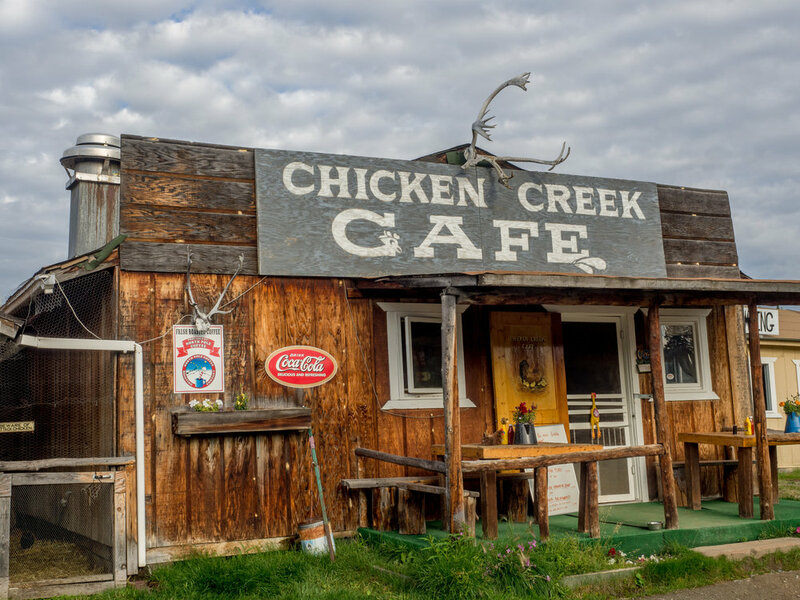 A few of the original buildings from the old mining town still exist and have been turned into - what else - a restaurant, a gift shop and a liquor store. We spent the night in Chicken and got coffee and a baked item at the cafe and continued south on the Taylor Highway. 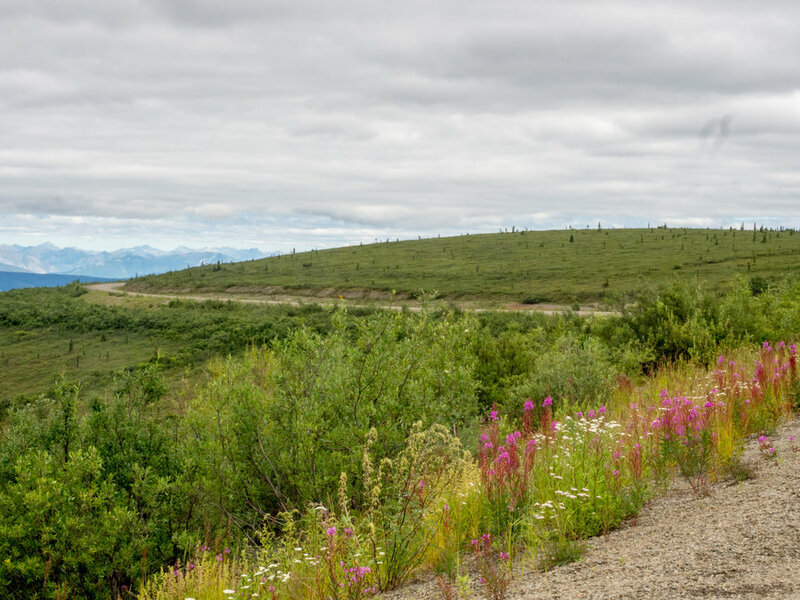 People we met and talked to along the way warned us about the state of the Tok Cutoff which is a road that allows you to shave off a bunch of miles of driving. The guys at the campground in Chicken said that it was exaggerated so we went with their opinion. They were totally right - the road was not great but as long as I took it slow and paid attention for upcoming frost heaves, it was fine. 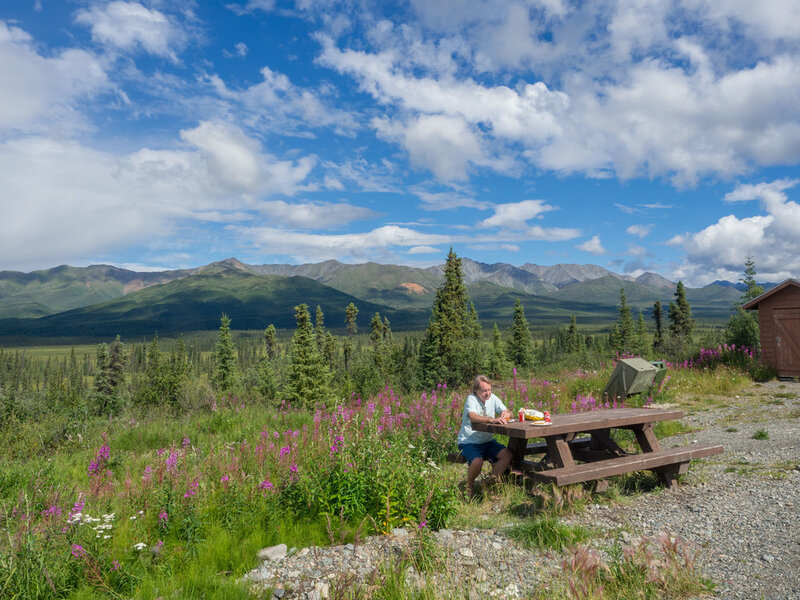 We passed through the town of Tok and continued south looking for a good place to stop for lunch. 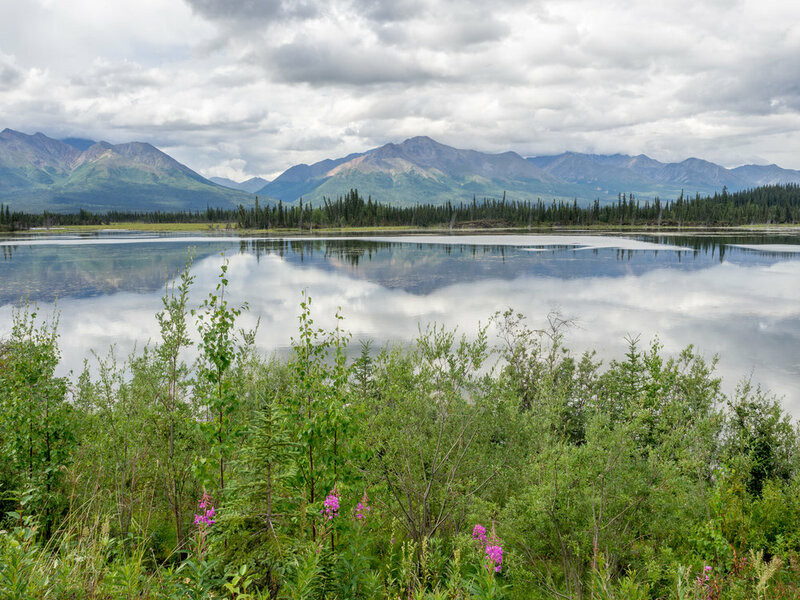 I had picked up a park flyer for Wrangell-St. Elias National Park at the visitor center in Tok and it showed a road that enters the north end of the park so we decided to see what that was like. 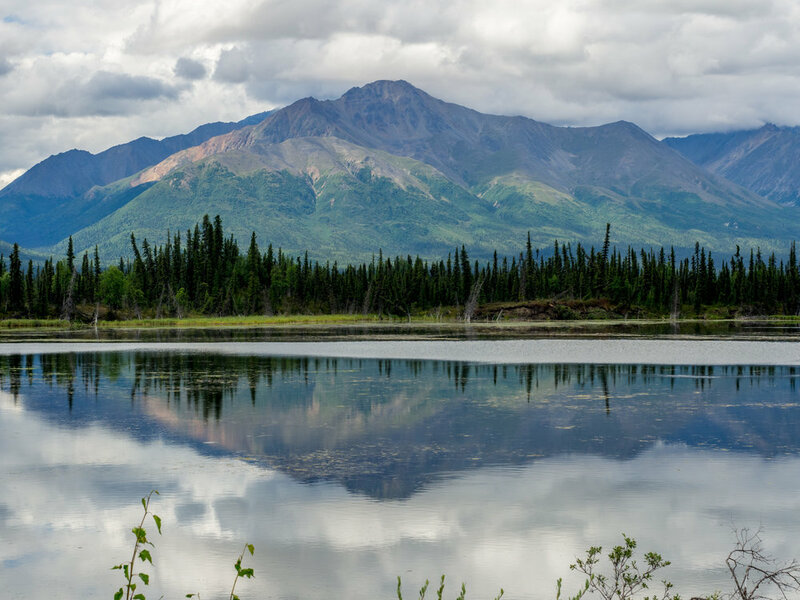 There are only two roads that go into Wrangell-St. Elias (which is one of the largest National Parks in the country) - one, in the north end of the park, is 42 miles long and the other, further south, is 60 miles long. Both are rough gravel. The one we were on was the northern access road. We had only gotten about 15 miles in and already knew we weren't going to gut out the full 42 miles. At mile 17 there was a beautiful pull out so we stopped for lunch. We ended up liking the spot so much that we spent the night there - ah, the beauty of having your house with you. In the afternoon, night and morning that we were there we saw a total of 4 cars go by. The only bad thing about it was the bugs... did I mention that mosquitoes are terrible in Alaska? 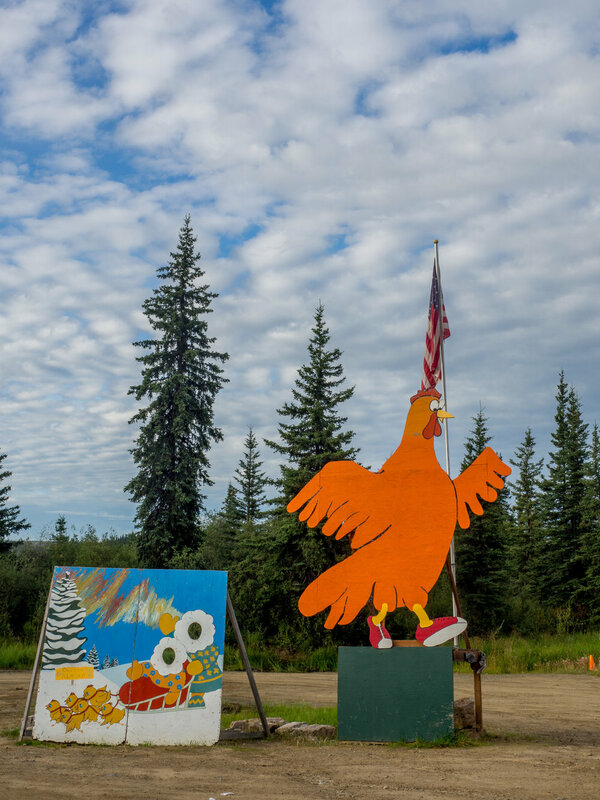 I read some really interesting history of this part of Alaska - it played a role in us buying the state from Russia. 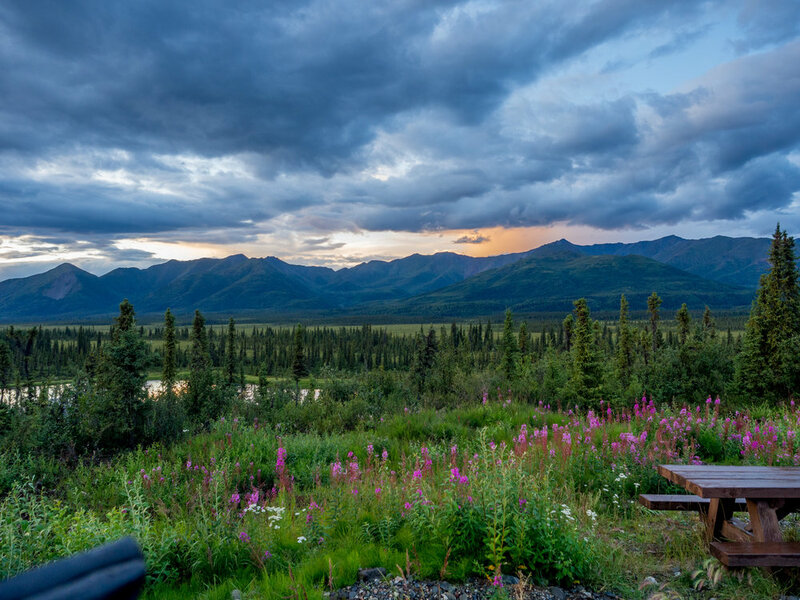 The Ahtna Native group that lived here were fearless warriors who fought the Russians hard every time they tried to settle in the Copper River basin. It is believed that their inability to get a stronghold in the area contributed to their decision to sell. 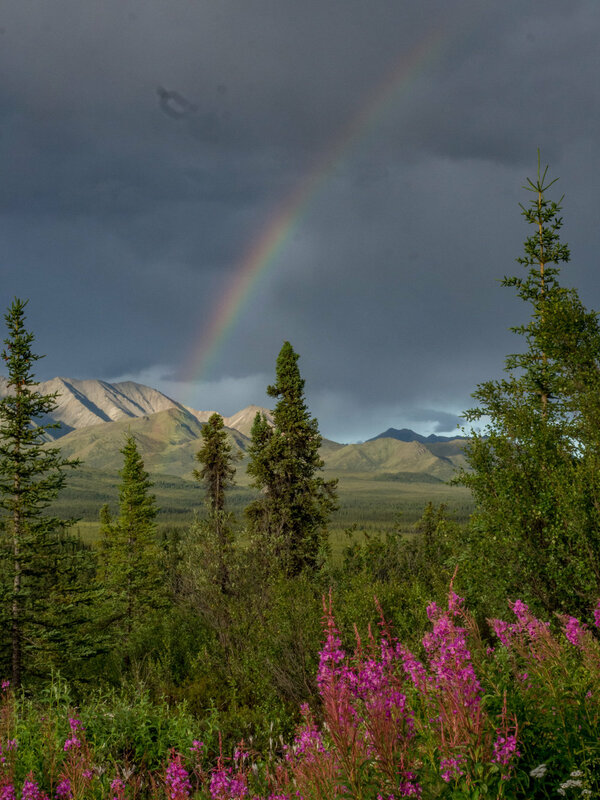 Another significant historical event from this area occurred around an Athabascan elder named Katie John who, in 1985, took the fight for Native subsistence fishing all the way to the Supreme Court eventually getting a ruling that was instrumental in laws today. We were watching the light change on the landscape over the course of the afternoon and it started to rain a bit. Then it got sunny again and a rainbow appeared! It was a really special thing. We'll be heading toward civilization again tomorrow. We'll go through Glennallen and on toward Anchorage on the Glenn Highway. We don't plan to stop in Anchorage and will decide how far to go as the day goes on.